Below you will find another great poster from our friends at Mighty Dog Graphics. This poster also offers sound advice when taking your cat to the boarding facility, or anytime you transport your cat. Please do not assume that you will NEVER need to transport your cat anywhere. It will happen. Click on the image to download it as a poster. Shared Blog Post – A Telltale Sign Your Cat Is Stressed – It is the Right Ear! 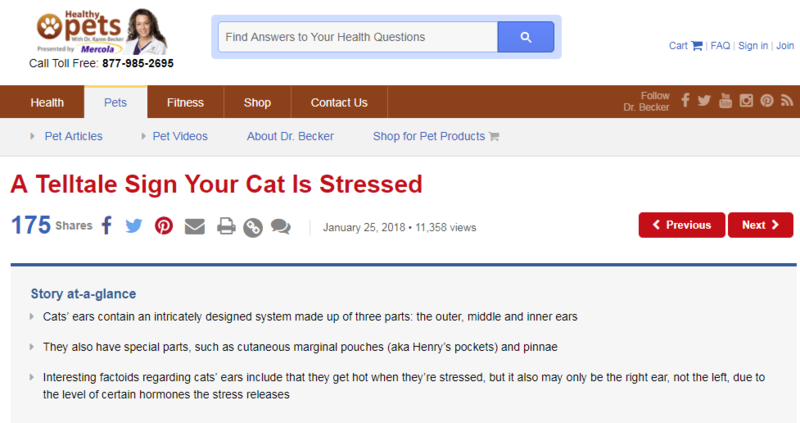 In her blog post of January 25th, 2018, Dr. Karen Becker discusses cats’ ears including how the right ear may heat up when under psychological stress. Cat Litter: Who Gets to Choose? Cat litter is not a topic that typically comes up in polite conversation. Unless you own a cat, you probably don’t think about cat litter at all. 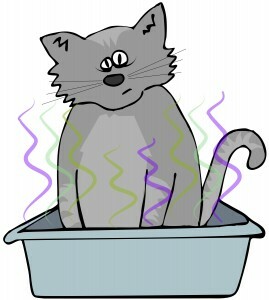 The initial premise behind cat litter, which was “invented” back in 1947, was to provide cats with an indoor bathroom. Cat ownership has steadily increased, and as more people keep their cats inside all of the time, cat litter has exploded into a $2 billion per year industry. The ASPCA estimates the average cat owner spends around $200 per year, per cat, on cat litter, $60 more than the average family spends on toilet paper in one year. On an annual basis, in the US alone, the need for cat litter results in the mining of five billion pounds of clay. Manufacturer’s process and package the litter that we then pour into our cats litter box. Our cat “uses” their box and then we scoop out the soiled litter and eventually dispose of it in a landfill. Cat litter has a significant monetary and environmental impact on the world. Version 1.0 of cat litter was pretty simple. It was a type of clay made of Fuller’s Earth that readily absorbed cat urine and thus helped to control the odors associated with cat waste. Since cats normally would urinate and defecate in the dirt outside, they easily adapted to using a box filled with this new “dirt-like” product. Over the years, efforts have been made to sell more cat litter by creating illusions of convenience and by making the litter box smell less stinky. Companies now use many alternate materials for cat litter. Among them are clays that readily clump around the urine, which makes the litter in the box last longer. In an attempt to reduce the environmental impact of clay litter, other materials are being used. These include; recycled newspaper, corn, wood pellets, environmentally-sustainable wood shavings and even green tea. Additionally, to make the litter more consumer friendly; basically to stink less after use, litter companies have added a plethora of chemicals to their basic product. These include things as simple and innocuous as baking soda, and less desirable ingredients like chemical deodorants, clumping agents, and even Teflon. Litter companies advertise their latest innovations in an attempt to get your attention. You decide that cat litter that stinks less is a great idea and then rush out and buy a bag without first consulting with your cat. When you run out of the old litter, you fill Garfield’s box with the new miracle product, proud that your home is going to smell better. That night you come home, sit down on your bed and feel the wet spot. One smell and you know that Garfield has decided your bed, with its new expensive mattress, is a better place to pee than the litter box. Cats are pretty particular about where they choose to go to the bathroom. If your cat dislikes where you have placed their box, if they don’t like the tactile sensation of the litter material; admit it you don’t like the rough tissue paper used in many public restrooms, or if they don’t like the cloying chemical smell of the litter, they will find a better place to perform their bathroom activities. So the answer to “Cat Litter: Who Gets to Choose?” is your cat. Whenever switching litters, provide your cat with two litter boxes; one containing the litter they have been using and one with the new litter. See which litter your cat prefers and if after a week they are not using the new litter, take a hint. NOTE: Male cats can urinate in inappropriate places if they are experiencing a urinary tract infection. This is not something to take lightly and minimally requires that you at least call your veterinarian. Other rules of litterbox etiquette that will make life with your cat or cats more pleasant. Have one litter box per cat, plus one. So if you have three cats you should have a minimum of four litter boxes. Do NOT have the litter boxes all in the same space, side-by-side, but instead have them located throughout your home. 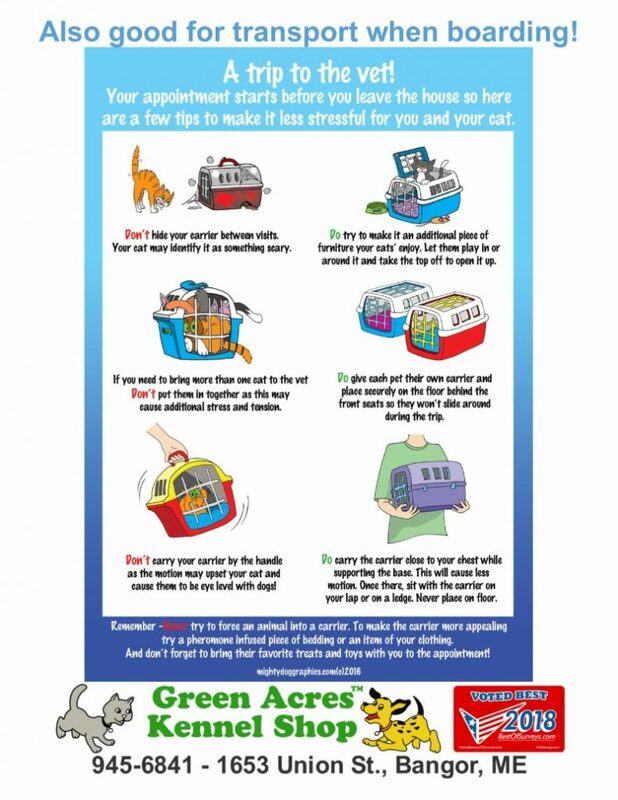 Make sure the litter boxes are not located in “busy” areas or any area where the dog can access them. Avoid placing litter boxes next to machinery, like a furnace that may startle your cat if it turns on while they are using their box. Scoop each litter box at least once per day, and clean it thoroughly once a week.